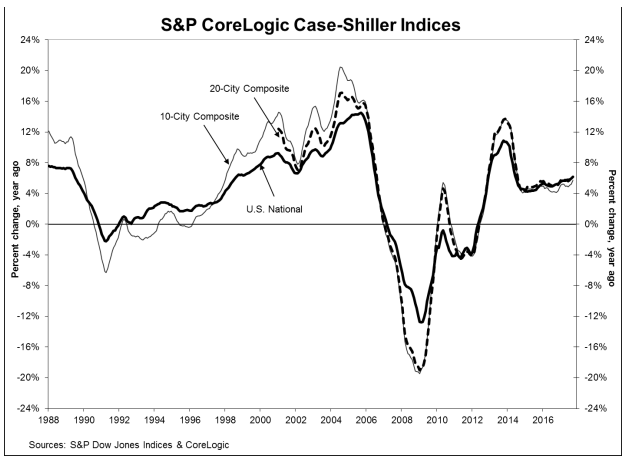 In September home prices rose 6.2 percent, up from 5.9 percent in August, according to the latest S&P CoreLogic Case-Shiller U.S. National Home Price NSA Index. The surge marks the strongest price growth in over three years. The highest year-over-year gains were recorded in the cities of Seattle, Las Vegas and San Diego. “Home prices, after multiple years of fast growth, still show no signs of cooling because of the ongoing housing shortage in much of the country,” said National Association of Realtors Chief Economist Lawrence Yun in a statement. “This fast appreciation over income growth is not sustainable over many years. Indeed, economic indicators — including low mortgage rates, the low unemployment rate, the rising cost of rent, and the 3.8-month supply of homes — suggest that home price gains will likely continue, noted David M. Blitzer, Managing Director and Chairman of the Index Committee at S&P Dow Jones Indices. “One dark cloud for housing is affordability — rising prices mean that some people will be squeezed out of the market,” Blizter said in a statement.